We've rounded up great savings on blackjack books, software, and other related material. We've arranged for these exceptional discounts and offers... read on for great savings and winning tips the next time you play blackjack! Amazing coupons and discounts for gamblers in Las Vegas! Anthony's Curtis' Las Vegas Advisor is full of great articles, plus the annual discount booklet of Las Vegas coupons on hotels, gambling, and more. 10% OFF subscriptions to the print publications Casino Player and Strictly Slots, just for BJI Subscribers! Click here! Casino Player is the best and most popular monthly print magazine on gambling in North America. Fantastic articles by well known experts such as Henry Tamburin, Arnold Snyder, Anthony Curtis, Bob Dancer, and others. The latest news about casinos and gambling in general. 10% off Blackjack 6-7-8 Strategy Cards... perfect strategy at your fingertips! NEW! You've never seen blackjack strategy cards like this before. Set includes 4 basic strategy cards covering single deck, double deck, 4-8 decks, and a unique Counters Basic Strategy (4-8 decks). Cards easily fit into a pocket or purse. Each card opens (tri-fold) into 6 panels that contain color coded playing decisions for different rule combinations (dealer hitting or standing on soft 17 and doubling after pair splitting allowed or not) plus instructions on how to use the card and the player's expectation. 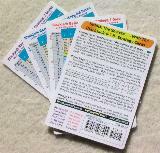 The Counter Basic Strategy card can be used by card counters who vary their bet based on the count. With these handy cards you'll always make the right playing decisions regardless of the playing rules and number of decks of cards. Special discount for BJI readers... normally $19.80 plus $4.95 shipping... just $17.95 plus $3 shipping. Click here to read our analysis and method. Get a $200 bonus on your first deposit. Play 100 hands of blackjack at their online casino. Read our complete statistical analyis and review. 30% OFF all books by Henry Tamburin at www.SmartGaming.com. Click here! Henry Tamburin, editor of the Blackjack Insider, is a well known author on blackjack and other gambling revues. As a special promotional offer, BJI subscribers can get 30% off on his books, including "Blackjack: Take the Money & Run". Visit www.SmartGaming.com for all the latest books, news, and ,information on blackjack and gaming. We've arranged an exclusive 10% off the purchase price of this great book. Normally $29.97... $26.97 for BJI subscribers! CLICK HERE to get this great savings. Michael Shackleford, editor of the popular Wizard of Odds web site and long-time blackjack expert. The GameMaster, gambling authority and operator of www.gamemasteronline.com. Kenneth R. Smith, gambling guru who runs www.blackjackinfo.com, a content-rich gambling portal. Henry Tamburin, yours truly and editor of Blackjack Insider. Dan Pronovost, President of DeepNet Technologies, makers of blackjack training software and co-editor of Blackjack Insider. The challenge put to these authors was: "you have 100 bucks, and want to double it by gambling. What the best way to do this?" This wonderful collection of over 20 articles provides a wealth of strategies to achieve this goal. CLICK HERE for information, and to order at the discounted price for BJI subscribers.